A course I am TAing for this semester opens each class with a mindfulness exercise for calming and finding one’s center. It starts, “Plant your feet firmly on the floor, adjust your posture,” moving eventually to noticing breathing patterns and trying to adjust them accordingly. As I joined the class a week late, I was unaware that this was part of the routine. Sitting there on my first day, I was a bit astounded that this was actually happening in the classroom. I should note that I was not inherently against it, but rather classifying it with any sort of religious ritual that might take place. At that moment, all I could think about was how this could not only be considered religious by some but also potentially could be making students very uncomfortable (whether there was a statement on day one of voluntary participation, I don’t know). However, having lived in Boulder for a year and a half, I have grown accustomed to Boulder’s affinity for Eastern religious practices or rituals — whatever those may be — and their pervading daily life. After the initial surprise wore off, I wondered why it was that this mindfulness exercise bothered me so much: Was it the context and the way it was presented in class?, Was it the fact that I was expected to participate?, or Was it because I was unintentionally assuming, in that moment, that this was or could be perceived as inherently “religious” in some way? If it was one or some combination of all of these, what was at stake in my particular definition and classification of this exercise in that moment? Of course, like with most topics, there are competing — sometimes contradictory — views on what mindfulness is and how it should be implemented. However, instead of getting caught up in the debate of whether mindfulness is inherently religious or secular — whether it should or shouldn’t be taught in schools –, we should instead consider how it is classified and to what end. With that approach in mind, consider, for a moment, this Tricycle article I recently came across on Facebook which invited Profs. Candy Gunther Brown and Saki Santorelli to argue for the religiosity or secularity, respectfully, of mindfulness. 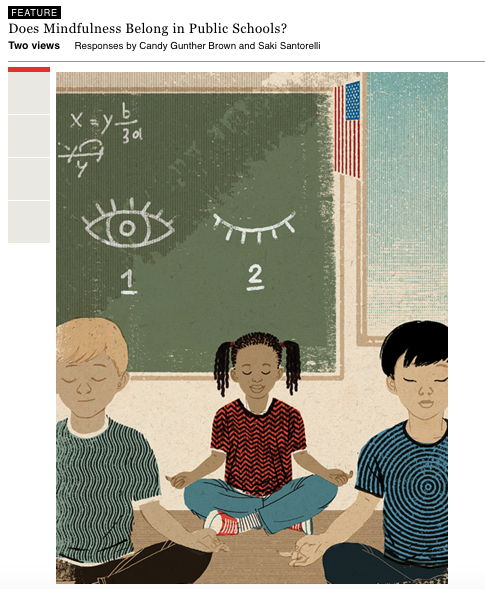 Tricycle blog, part of Tricycle Foundation which works to make Buddhist teachings and practices available to Western audiences, asked these two professors to weigh in on whether mindfulness should or should not be taught in public schools. These answers reflect similar stances taken in debates over whether yoga should be taught in the classroom — debates to which Prof. Brown has also contributed. Is it (whether yoga or mindfulness) inherently religious, and therefore is its presence in public schools unconstitutional? Or is it a secular practice with ties to religion that can be either acknowledged or ignored? It seems to me, however, that the practice of mindfulness is not itself the problem. Rather, the problem is the conflation of mindfulness and religion. Yet while mindfulness is an ethos—the core being “Do no harm”—mindfulness is not a religion. And while my colleagues and I openly acknowledge the centrality of mindfulness in classical Buddhist meditation practice, Buddhism holds no exclusive claim to it. … Mindfulness is awareness itself—the knowing capacity that we consider the central feature of our humanness. Nonreligious, mindfulness does not ask someone to adopt a predetermined belief system or dogma. In his response, Santorelli offers a social perspective on mindfulness and its benefits — he argues that mindfulness practices and Buddhism aren’t mutually inclusive. This approach is seemingly socially progressive in that it acknowledges the cultural history of mindfulness but sees it more as an inherently human practice, one from which all can benefit, regardless of religious (un)affiliation. Of course, I assume Brown would have much to say about the problematics of Santorelli’s approach, but I want to steer the conversation in a somewhat different direction. In the supposedly oppositional arguments presented by Tricycle, both Brown and Santorelli ultimately have a very similar approach to talking about mindfulness. Despite Santorelli’s seemingly inclusive, progressive understanding of mindfulness, he relies on an essentialist perspective in the same way that Brown’s approach does. While Brown’s argument is for the inherently “religious” aspect of mindfulness, Santorelli’s is for the inherently “human” aspect of mindfulness. Both of these constructions of mindfulness practices promote a notion of mindfulness as distinct and separate from social influences: On the one hand, Brown argues that the inherent religiosity of mindfulness requires it to be set apart from daily life — private, distinct –, on the other, Santorelli argues that this is an inherently human phenomenon — a way one can get away from or step outside of the social world we inhabit, and thus its constant conditioning to which we are subject. Both of these approaches argue for the distinctive, set-apart (let’s call it personal or private) nature of mindfulness, and in this way aren’t too different at all. However, if we are to move away from the debate over what mindfulness is to look at how it is being classified and constructed by different — perhaps competing — social groups for varying reasons, we can then look at this classification of certain rituals, i.e., mindfulness, as being necessarily social, or public. For these private constructs of mindfulness (i.e., separation of religion and State or separation of the individual from the social) are dependent on social classifications that then set them apart to make them distinct, private, or sacred. That is to say, that these notions of mindfulness presented by Brown and Santorelli are not descriptive of the inherent nature of mindfulness, but rather are constructed in particular ways and then strategically set apart for a particular purpose. So instead of seeing the arguments made by Brown and Santorelli as expressing the true nature of mindfulness, we can look at them as competing social constructs that are promoted and then internalized and reproduced as private, interior expressions and understandings mindfulness practices. So before I get too caught up in the legitimacy of the mindfulness exercises in my class, I should step back to see how it is being promoted. In this instance, I understand what is at stake in the secularity argument that Santorelli makes, and I can see its prevalence in my own class. But rather than being preoccupied with the (ir)religiosity of it, I should look to see what sort of understandings it promotes to the individual. For if we are to see this necessarily social practice as private and distinct (and therefore see the individual as distinct from the social), then we can better understand how notions of group and individual identity are being shaped in that very process. This entry was posted in Grad Blog, Guests, Relevance of Humanities, Religion in Culture and tagged Andie Alexander, Buddhism, Candy Gunther Brown, Classification, Essentialism, Mindfulness, Private, Public, Saki Santorelli, Strategic Essentialism, Tricycle by Andie Alexander. Bookmark the permalink. Could not sitting with a mind to notice moment to moment experience complement all your thinking about what you were invited to experience at first? Not intending to dismiss the intellect in the debate, rather simply inviting a return to breathing and have it be your teacher, too. Whether one finds or could find these practices useful, beneficial, or productive and to what end, I cannot say. But I think your question nicely illustrates my point in that talking about these practices — whether mindfulness, meditation, breathing exercises, etc. — as if they are inherently beneficial or agential in helping one to achieve better understandings or insights, necessarily relies on this strategic essentialism of a very social and varying practice (i.e., a practice that is not uniformly or universally understood or performed), and as such, it reproduces certain conceptions and constructions of how mindfulness practices “should” be understood. So the question then would be: Why is it we rely on these essentialized notions of mindfulness practices (instead of seeing them as socially contingent and constructed), and what are the broader implications of these understandings, both politically and socially?